We have reviewed, rated and compared Trane air conditioners so you can buy with confidence. These AC’s are not for suitable for everyone so check to see if they fit your needs! More than 5 million central air conditioners were sold in the US in 2017 alone. This marks an all-time high since the air conditioner market’s downfall started in 2006. However, with the climate getting hotter and hotter each day, and air conditioners becoming more affordable, this number is predicted to grow and beat 2005’s record of 6.47 million in the next few years! With the arrival of summer, the first thought that comes to mind is to find a good air conditioner. You can purchase from a large range of room air conditioners for your home and enjoy the chilled environment they provide, or go for a central air conditioner for a more energy-efficient alternative to cool your entire house. Trane, also known as Ingersoll-Rand, is a very popular and trusted air conditioner manufacturer, enjoying a market share of 10%! This is a considerable share, making Trane air conditioners the third top HVAC brand out there. Here, we will dive deeper into the brand’s AC units to figure out whether Trane air conditioners are the best choice for you or not. As you will see ahead, Trane air conditioners are good all-rounders with a particular focus on efficiency. Whether you are looking for an economical AC unit, good warranty, efficacy, or a low profile AC, there’s one for every need. However, that is also where the problem lies. All these features are available in different units. If it is economical, it isn’t very efficient or quiet. In order to get the best blend of all these qualities, you need to invest in Trane’s premium unit, the XV20i. Keep in mind though, this isn’t the best option for those living in areas with short summers since the efficiency starts paying back only after running a certain number of hours per year (7 or more hours per day). According to Energy Star, a typical household spends 13% of its utility bills on cooling. This 13% might increase if the appropriate air conditioner is not chosen. So it’s important to choose the most cost-effective and efficient AC unit. Trane AC units are some of the more reliable air conditioners out there with a generous 10-year limited warranty and an eloquent promise of efficiency. And with nine, distinctive central air conditioners to choose from, you get a slew of options when it comes to purchasing and running costs. Following is a table that compares the installation and expected running costs of different Trane air conditioners that are currently available in the market. Trane has an average SEER of 17.33, thus giving each unit a lower running cost compared to its competitors, regardless of the initial cost. While buying low SEER and cheaper units might seem attractive initially, remember that the higher the efficiency or the SEER, the better off you’d be in the long run. Although Trane AC units are somewhat more expensive than others available in the market, spending on a high-quality unit is worth the price in the end. Trane air conditioners’ tonnage starts from 1.5 all the way up to 5 tons, perfect for different sized rooms. Trane boasts its efficiency and warranty above all else, with a different air conditioner unit for everyone, whether they prefer a noiseless cooling solution with sleeker design or an economical, more efficient cooling unit. Trane’s XV20i is its most efficient air conditioning unit, with a SEER of 20. That fact that there is a government tax rebate upon purchase of this unit is a big plus when it comes to considering your options. Whether you can make your own shed or repair your car yourself, installing a thousand-dollar (at least!) air conditioner yourself isn’t advised. You could very well be successful, but the installation process isn’t just plugging a few wires and screwing a few couplers. It includes complex details that need to be kept in check in order to maximize your unit’s life. Proper installation can be worth 10 or more years of life for your air conditioning unit. Hiring a quality HVAC contractor pays for itself in the long run as they ensure that your unit doesn’t have any installation faults. There are numerous HVAC contractors that can install your Trane air conditioner for you quickly and in the proper manner, following your state’s code. HVAC contractors might seem like a waste of money, especially for a DIY enthusiast, but that is not the case. These contractors go through extensive theoretical and practical training before they are certified to work for the public. Modernize.com is a user-friendly website that screens all the contractors near you and lists them based on their success and ratings so that you get the best possible match for all your HVAC installation needs. To make it easier for you we have added a form that will initiate the process. Simply follow the steps to get a quote! All Trane products have unique model and serial numbers, each representing a different class of products. Trane recommends using its higher-end units because of the external technologies they use. For example, the best model Trane has to offer is the XV20i with its TruComfort™ technology. This technology allows the unit to run at precise speeds to regulate the inside temperature as and when required, thus saving electricity. Similarly, Trane VX18 is branded as the quietest unit with running noise going as low as 40-45 dB! Moreover, the XR14 is one of the most affordable air conditioners with the best SEER at low cost. We have mentioned SEER quite a few times above, and here, we shall dig into a bit more detail about what it means. The SEER, or Seasonal Energy Efficiency Ratio, is a critical factor to consider when purchasing an air conditioner. It is a measure of the ratio of BTU to how much energy is consumed when your unit is running. In simple terms, it is the efficiency of air conditioners, heaters, and refrigerators. The higher the SEER, the more energy efficient that AC unit is. 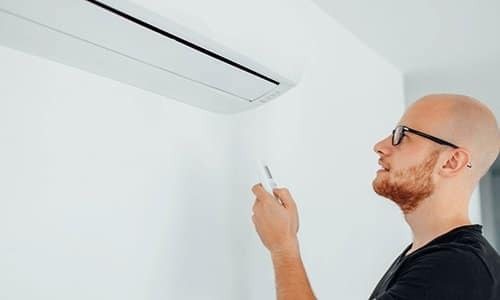 Some governments also offer tax rebates for buying air conditioners above a specific SEER rating (16), while those below 13 are considered illegal. Trane air conditioners are considered to be both, extraordinarily efficient and ‘wallet-friendly’, compared to its competition. In fact, that is exactly how the Irish company has managed to gain more market share than many major HVAC manufacturers! Some brands such as Lennox, LG, Mitsubishi, and others, might be slightly more efficient compared to Trane ACs, but they can’t compare to its low cost and unbeatable warranties. An air conditioner has multiple parts working together in order to cool hot air and blow it through the vents, into your house. While all the parts are essential, some of them are critical. The compressor is one such critical component, known as the ‘heart’ of air conditioning systems. The compressor, in an AC, is the component responsible for moving the refrigerant throughout your unit’s coils with the help of high pressure. This high pressure results in cooling the gas down (turning it into a liquid in the process), and when hot air passes through the coils holding the cold gas, it gets cooled and thrown back into your room. Single stage compressors are exactly what the name suggests – having only one phase. They run on their only phase, i.e., full speed, when cooling the room, and turn off once the desired temperature is reached. When the room temperature starts rising, the compressor turns on again to begin cooling all over again. Single stage compressors can cool the room quickly, but the constant switching on and off consumes more energy and results in higher electric bills and fluctuating temperatures. Two-stage compressors can run on both, high and low speeds. High speed is for cooling the room, and once the desired temperature is achieved they slow down, maintaining the temperature. The slower speed helps in maintain its inertia and thus, be more efficient. Trane AC compressors are one of the most efficient ones in the market, coming in both types as shown in the table above. 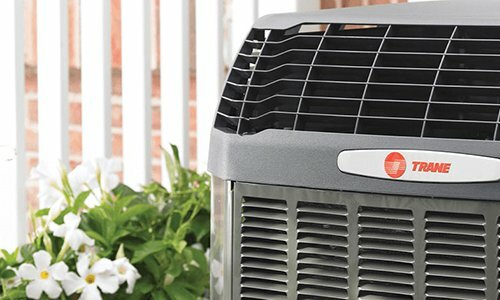 Located in the outdoor unit of your air conditioner, the condenser fan keeps the condenser cool when it is running. Condenser fan motors are also of two types, single speed and double. Trane’s XR14, XL16i, XR16, XR16 Low Profile, and XR13 are all single speed, while Trane XV20i, XV18, XL18i, and XR17 are double speed. Most air conditioners can also heat your house instead of gathering dust (or snow) in the winter season. Many HVAC units have heat pumps installed in them, or have compressors that can act as heat pumps. For heating, Trane air conditioners’ compressor puts negative pressure on the gas, thus making it hot. When cold air passes through these coils, they actually act as heat pumps, effectively turning your air conditioner into a heater. Trane air conditioners are a blend of quietness and efficiency due to their sleek designs and insulated bodies. The designers used materials such as rubber or other noise absorbents to reduce the noise the air conditioner makes, especially the VX18. The VX18 can go as low as 40 dB under optimum conditions, and to give perspective to how quiet that is, 25 dB is slightly louder than a whisper! Not only is the VX18 quiet, other Trane AC units are extremely quiet as well; although there are a number of competitors who manufacture even quieter units. However, Trane provides good efficiency at a lower price, if noise is not an issue for you. Warranty is a major selling point for many HVAC manufacturers. To make their units seem more attractive, there are some manufacturers, such as Goodman, who offer lifetime warranties to their customers on parts. Trane air conditioners don’t lag behind on such offers, giving their customers up to 20 years of limited warranty on replacement parts! However, it doesn’t cover the cost of labor, like with other manufacturers out there. Hiring quality labor might seem daunting at first, but with modernize.com, it is more than easy to find screened and trusted HVAC contractors around you. Registering your Trane AC within 60 days of installation, either on phone or online, will increase your Base Warranty from 1 to 20 years! This is where Trane is able to compete with other HVAC manufacturers, in terms of warranty. You can also purchase an Extended Warranty if you wish, which will not only cover the cost of parts, but also the labor! Most states offer tax credits as incentives for buying high-efficiency equipment, such as high SEER air conditioners, efficient heaters, refrigerators, etc., allowing users that buy a more efficient air conditioner to save on their taxes as well! Trane Air Conditioners are eligible for a tax break of USD 300 on each air conditioner purchased with a 16 SEER or above. Tax break plus high efficiency, combined with the low cost of these units, make up for the perfect cost saving unit you can buy. Lennox air conditioner is a major manufacturer known well for its high-efficiency units. It’s no secret that Lennox’s high-end unit is much more efficient with a 26 SEER against Trane’s 22, but the cost difference is huge as well. Following is a table highlighting the differences between the two. Top models contain more features such as WiFi, Nexia, etc. Top models contain more features such as WiFi, Alexa, etc. Costs more in some remote areas but customers are happy with repair work. Customers often complain about Lennox repairs. Generic parts don’t work. Trane users have very less complains but sometimes complain about the high maintenance and repair cost. Lennox users sometimes have complaints about repair work, but only when the unit breaks down, which is not that often. Trane is an HVAC manufacturing company, founded in 1913 and headquartered in Swords, Dublin, Ireland. Trane now employs more than 29,000 people and has 104 manufacturing plants in 28 different countries. With over $8 billion in sales, it is one of the most significant HVAC providers in the market due to its highly reliable products, low costs, and long warranties. However, every AC brand has bad and good features, no matter how hard it tries. Following are some pros and cons of Trane air conditioners. Not a good low to mid efficiency choice. There are less expensive options available. Wholesaled to external HVAC installers without checks. This has allowed inferior installers to enter the market. At the end of the day, no matter how much a manufacturer boasts about its product, it is often the word of mouth that determines whether someone actually buys it or not. While we have tried our best to give you a crystal clear picture, here are some reviews by people who purchased Trane AC units. Considering this subreddits is dominated by residential work, you will see a ton of guys repping carrier over Trane for some reason. As a guy who specs out anything from 3 ton residential split systems to 500 ton centrifugal chillers, Trane is way better than Carrier all day in my book. – Reddit reviews. I prefer Trane as well. Carrier tends to be cheap and Lennox is like working with apple products. But when I work with the factory commissioners from Trane and you bring up the phrase it’s hard to stop a train they say back it’s hard to start one too lol.. – Mikey Stealth, Reddit. As is clear from these reviews, while there are some who aren’t satisfied with Trane’s products (as is the case with every HVAC unit), most people are pretty happy with Trane’s air conditioners. Trane is an excellent choice if you are looking for a cost-effective and efficient cooling solution, especially if you can go for the XV20i. The 22 SEER unit is the best fit for you if you are looking to run your air conditioner for the better part of the day. Trane is a good all-rounder – cost-effective, quiet, efficient, and sleek. However, if you want something with extreme efficiency (over 25 SEER) and are willing to spend the money, there are other brands that you should look to. You can visit Modernize by filling in the form and find a trusted HVAC installer for a quote and get help with installing a new AC or getting an upgrade.